New England cottontails are legally protected in New Hampshire. Possession and take (which includes harming, harassing, injuring and killing) is illegal. Description: 15-17” in length with a brown and gray coat that does not change color with the seasons. 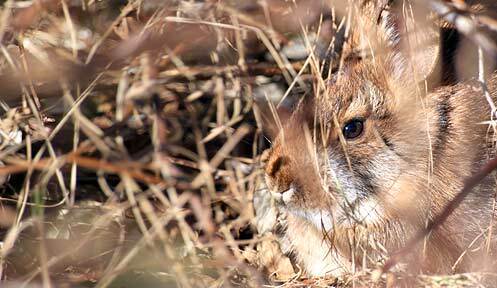 A black spot between the ears and a black line on the leading edge of the ears can help distinguish between Eastern cottontails, but is not always present. Commonly Confused Species: Eastern cottontails tend to be larger and lack a black spot between the ears and black on the front leading edge of the ear. The skull of the Eastern cottontail has smooth nasal sutures and a large fused supraorbital process. 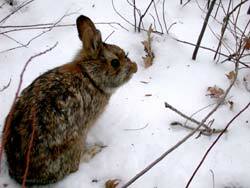 The New England cottontail has wavy nasal sutures and small non-fused supraorbital process. DNA testing is usually the preferred method for positively identifying between Eastern and New England cottontails. Life History: New England cottontails breed throughout the spring, summer, and sometimes into the fall. They have 3-8 young in a litter and may have 2-3 litters per year. New England cottontails are active year round during dawn, dusk, and at night. In the summer they feed on grasses and forbs and in the winter they feed on bark, twigs, and buds of shrubs and young trees. 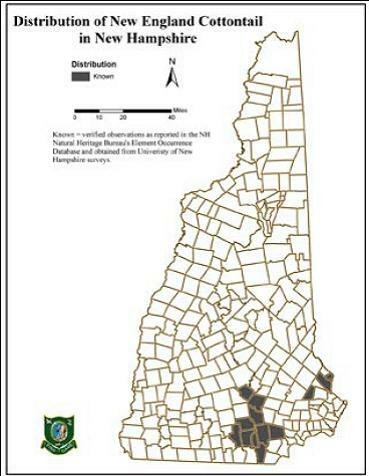 Learn more about efforts to restore New England cottontails throughout their former range including habitat improvement projects occurring in New Hampshire at newenglandcottontail.org.